Category management conducts continual analysis to stay ahead of trends, risk, demands or supply changes. Category management also incorporates a demand management program to better understand the demand structure for goods and services used by the company and prioritize them appropriately. This ensures that the company is not wasting money. Category managers also work closely with suppliers to continuously innovate, achieve better outcomes and add value. It requires input from various parts of the company supply chain and involves many stakeholders. Free Download: Get the template to develop a business case for category management in a specific spend category. Category managers must have a detailed understanding of spend, demand, providers and markets to challenge how goods and services are acquired and delivered. The top industries with category management adoption include retail, consumer goods, and food and beverage. According to LinkedIn, the median salary of a category manager is around $100,000 per year. A category manager needs a broad range of skills to be successful: Hard analytical skills, such as the ability to analyze large swaths of data to identify trends and gaps in the market, the ability to implement a strategic plan aligned with the goals of the business, as well as soft skills to communicate and negotiate with internal and external stakeholders. The benefits of implementing a category management program include better outcomes, improved quality, greater savings, efficient use of resources, a better understanding of the market and an increased focus on collaboration and innovation. Category management can also alleviate tedious tasks, such as each business unit sourcing their own pens, by bundling and streamlining providers and contracts. 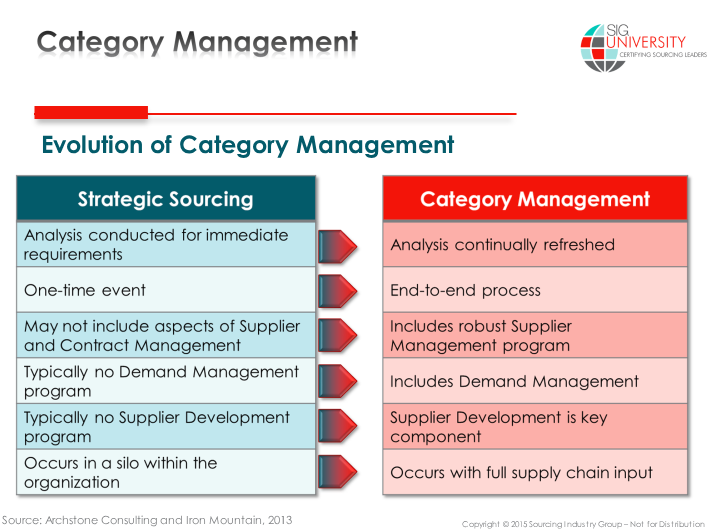 Unlike strategic sourcing, category management takes a proactive instead of a reactive approach to sourcing, which provides more insight into factors that may impact the price of a service or good. The category manager is positioned to elevate procurement as a trusted and respected business partner due to a deep understanding of spend categories and the ability to tackle waste, duplication, maverick and out-of-control spending. It also allows for greater ability to prioritize and strategize, which creates leverage to attain lower pricing and quality of services from providers. A category manager acting as a catalyst will confront friction when trying to implement a category management program across the organization. Individual business units can be skeptical that the priority will be on cost control over quality, they can be resistant to change in general or they are worried about the impacts the changes may have on their current suppliers by rocking the boat. To change the tide from skeptics to adopters, the organization must use methods that address concerns from business units and stakeholders. The category manager can alleviate concerns through open communication, creating a clearly defined value proposition and connecting with (and listening to) stakeholders across the organization. Adopting a category management approach to sourcing will have improved contract outcomes as the process is managed end-to-end. Analytical tools that provide greater clarity and visibility into spend categories will need to be acquired, as will the talent to utilize the analytics tools. As the category manager globalizes spend categories, it provides an opportunity to collaborate with suppliers to be more agile, innovative and responsive to the businesses goals. Interested in learning more about category management? Visit the SIG Resource Center for templates, business cases, white papers and best practices from leaders in the industry or enroll in SIG University’s 12-week CSP certification program. Check back in for Part 2 of this blog series on creating a category playbook.